Nonie has a new jacket! 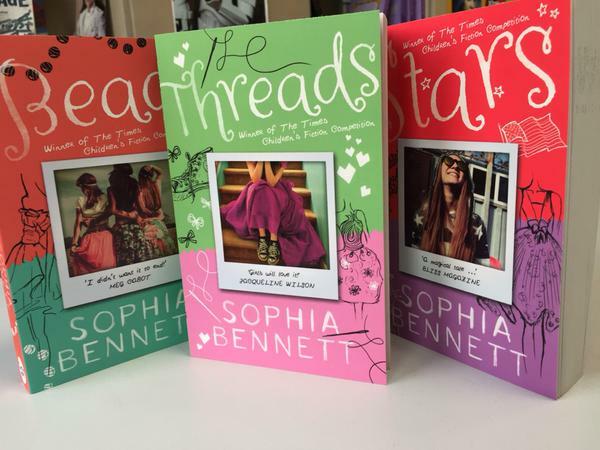 Over the years, Threads has appeared in a variety of covers around the world. One of the things that most surprised me when the book came out, six years ago, was that it would be translated into Norwegian, and Brazilian Portuguese, and French and German and Croation and Japanese and … a whole host of languages, not many of which I speak. Nonie and Co are much better travelled than me. I loved the French cover (which was cartoon-like, and featured Crow, which was good), and the German one (which was simply a collection of cotton reels – Nonie would have loved it too), and the UK hardback edition with an illustration by Giles Deacon, which didn’t sell very well but was Extremely Beautiful. It hadn’t occurred to me that a book could have so many different guises – some great, some not so much. Anyway, now the whole Threads series has a new set of paperback covers in the UK (publishers call them jackets – Nonie would approve), and at my suggestion we’ve even renamed books 2 and 3. ‘Beads Boys & Bangles’ and ‘Sequins Stars & Spotlights’ were hard to say, and took up a lot of cover space, so now they’re simply ‘Beads’ and ‘Stars’. I like them much better that way. The illustrator for these editions is Helen Crawford-White, and I love the way she draws. Check out the little details – Nonie’s Converse, the Taj Mahal, the Statue of Liberty … and Crow’s designs, done with the flick of a pen. It’s lovely to see Threads in new clothes. Nonie never wore the same outfit twice, so she’s very at home in a different jacket. Do you like them? Let me know. And don’t forget to read the stories! If you love fashion or friendship, then Nonie’s just waiting to share her ups and downs with you. Oh my god Sophia! They’re fabulous! I love them Nonie would totally approve. Error: Error validating access token: Session has expired on Friday, 08-Feb-19 03:57:19 PST. The current time is Tuesday, 23-Apr-19 15:02:44 PDT.